In ancient times, a massive Egyptian obelisk was brought to Rome and set up in what would eventually become known as the Circle of Nero. 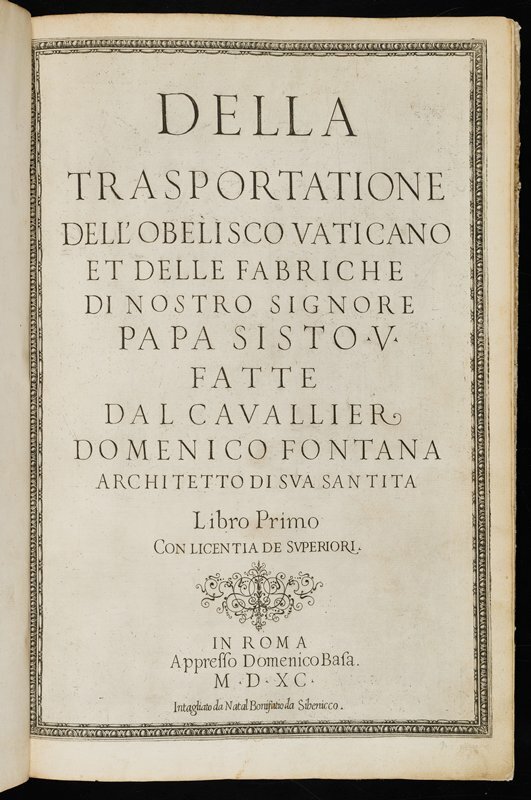 In 1585, Pope Sixtus V wanted to move the 340-ton stone needle so that it would stand before the newly rebuilt Saint Peter’s Basilica. Unfortunately, the ancient knowledge of how to move such a massive object had been forgotten. A competition brought forth hundreds of ideas on how to do it, many of which would have been disastrous if attempted. The winner was Domenico Fontana, who went on to complete the task with great success. In this book he describes and illustrates in detail the amazing process, which involved the synchronized labor of hundreds of men and horses. Engraving, etching and letterpress; bound volume.